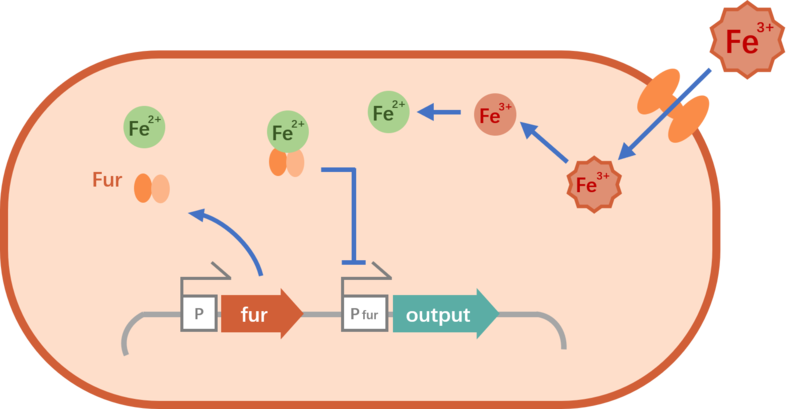 Fur is a transcription factor that binds to fur box using Fe2+ as a helper repressor to inhibit gene transcription. The inhibition mechanism is shown in Figure 1. The Fe3+ is transferred into the cells by siderophore, and then Fe3+ is reduced to Fe2+. The Fe2+ binds to the Fur protein, and Fur-Fe2+ complex binds to the fur box to inhibit the expression of the export gene. 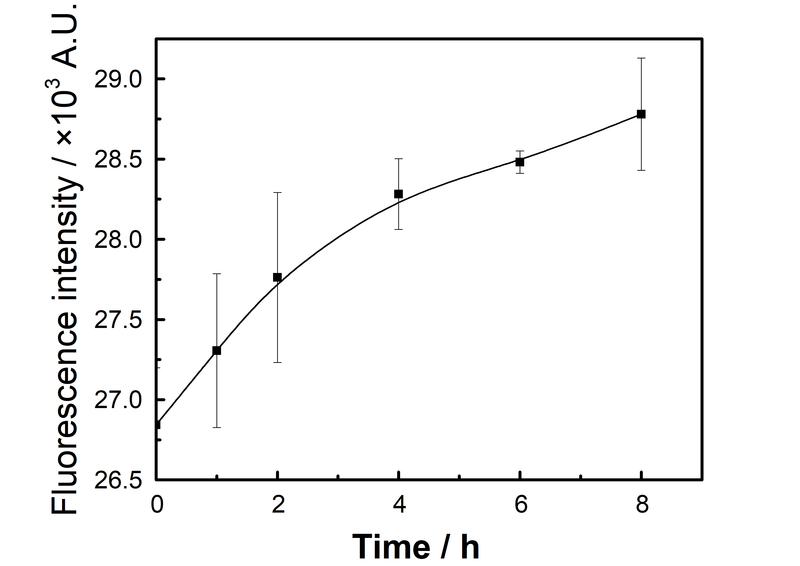 As the siderophore is continuously secreted outside the cell, the concentration of the extracellular siderophore-Fe3+ complex is continuously increased. 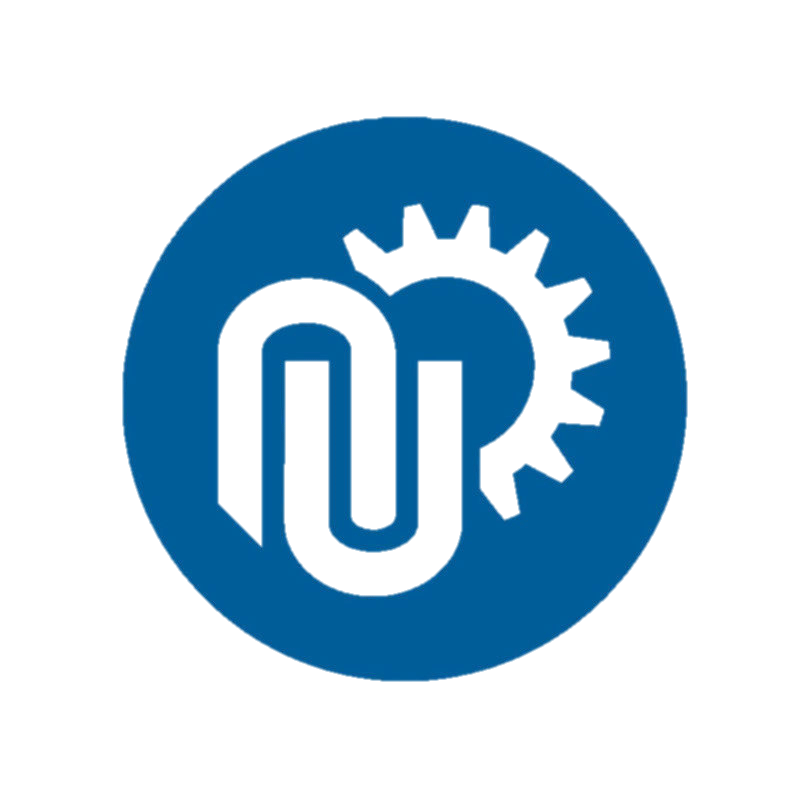 We want bacteria to be able to perceive the signal of high iron concentration (because this signal represents the degree of damage to the microenvironment that bacteria are living - rust), and the rust is converted from solid to ferric ions that are soluble and absorbed by the engineered E.coli. That is to say, when the external Fe3+ concentration is high, the gene is in a condition of being suppressed. This is exactly the opposite of what we hope to be when the external Fe3+ concentration is high to trigger gene expression, so we need to introduce a reversal system. We reversed by introducing a lacI gene. As shown in Figure 2, when the concentration of external Fe3+ is high, the expression of the lacI gene is inhibited. At this time, the lacI gene cannot suppress the output, that is, the opening of the output gene is achieved. 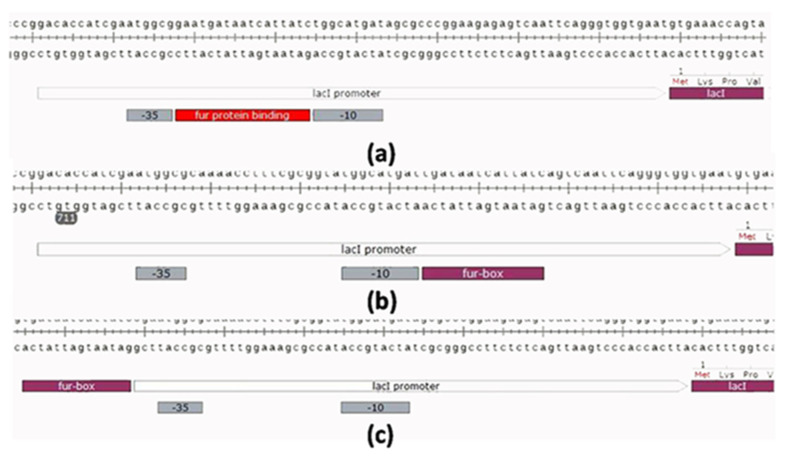 Among them, the Fur protein binds to the 19-bp inverted repeat Fur box (GATAATGATAATCATTATC) with high affinity. There may be different positional relationships between the Fur box and the promoter, and this positional relationship results in a change in the iron concentration response threshold. In order to be able to adjust this threshold, we have designed three different positional relationships, as shown. We design to insert fur box in different site of promoter to characterize different fur box response to ferric iron concentration. We use mCherry as reporter to characterize strength of promoter. 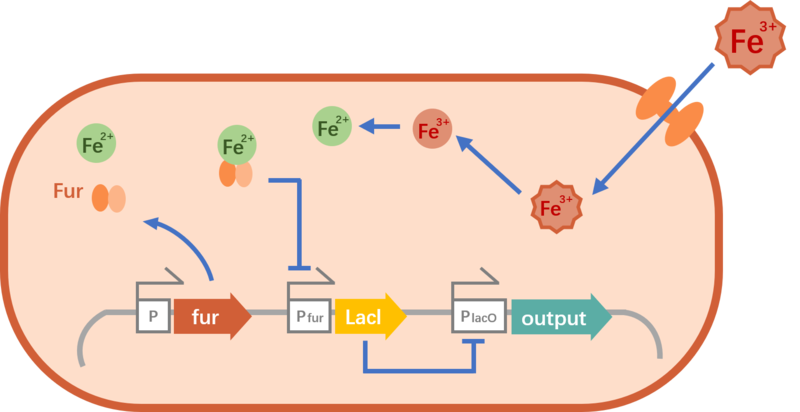 Under conditions of high(10-5M) and low(10-7M) concentration of ferric iron, fur1,fur2 and fur3 has different repression efficiency. So we want to select a fur box, when there is low Fe concentration, mCherry has the most fluorescence intensity, and when there is high Fe concentration , mCherry has the least fluorescence. Bacteria is cultured in LB culture medium adding with different concentration of Fe over night, and expression of mCherry is measured. From the figure we can see that, fur2 has the least relative expression. 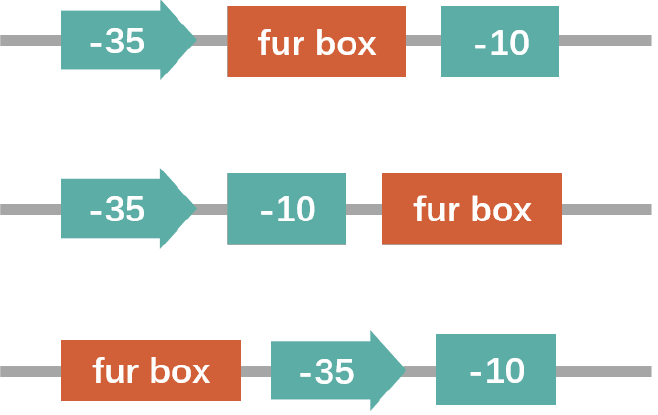 When Fe concentration is low in medium, Fur can not bind with fur box. mCherry can be successfully expressed. So we need to choose fur box downstream which, under this condition , mCherry can have high expression. Figure 3. Fluorescence intensity of mCherry under regulate of 10-5M Fe. After lacI is constructed into our system, it becomes fur invertor system. That is to say, when Fe concentration is high, mCherry can express. So we measure fur2, under Fe concentration is 10-5 M, mCherry can express.